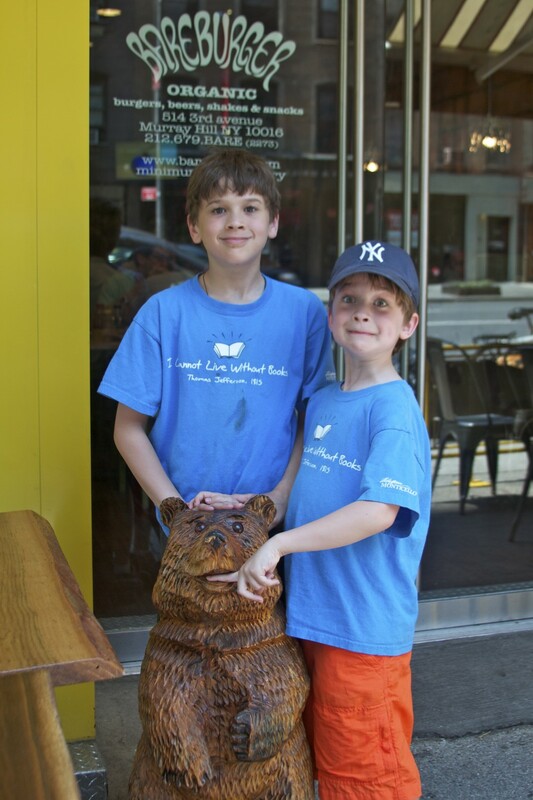 When the boys are out of school in the summer we like to take a few trips into nearby New York City. We always have fun adventures. 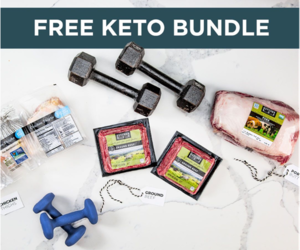 Recently, we trekked to Bareburger, a restaurant I have been interested in trying ever since hearing about it from a friend at Paleo FX in Austin. We journeyed to the heart of Midtown Manhattan to find this Paleo-friendly burger joint. Benjamin was excited. He gave me his best suave look. 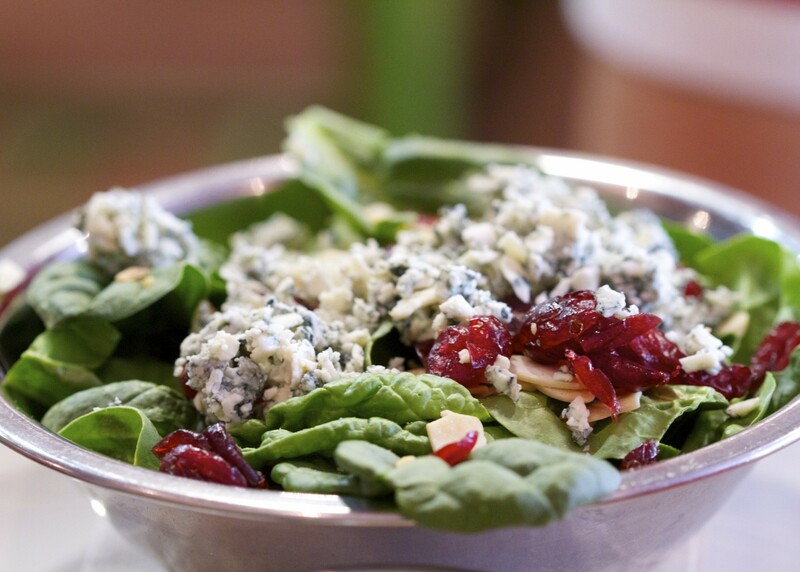 Bareburger offers organic, all natural, free-range, grass-fed meats; organic and all-natural cheeses; and organic vegetables. They partner with local artisans and sustainable farmers and emphasize old-fashioned quality. 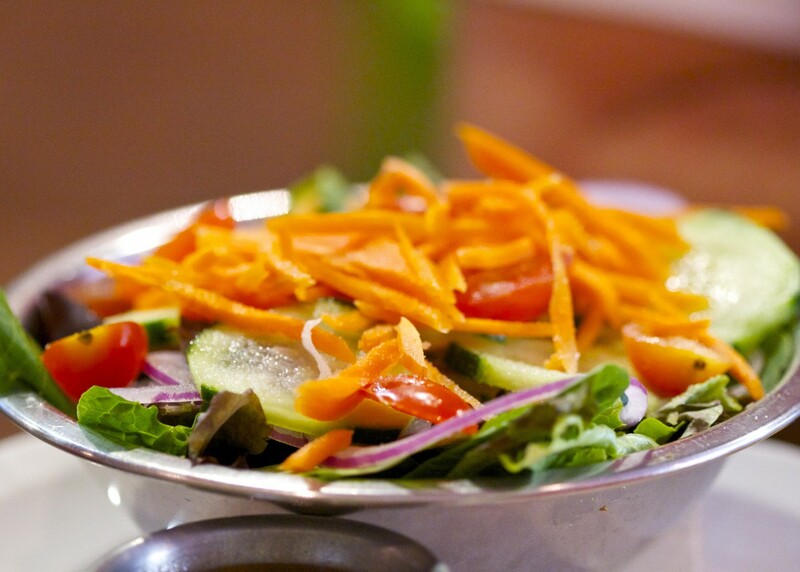 All of the meats and poultry are gluten-free, as are the salads, sauces, and French fries. 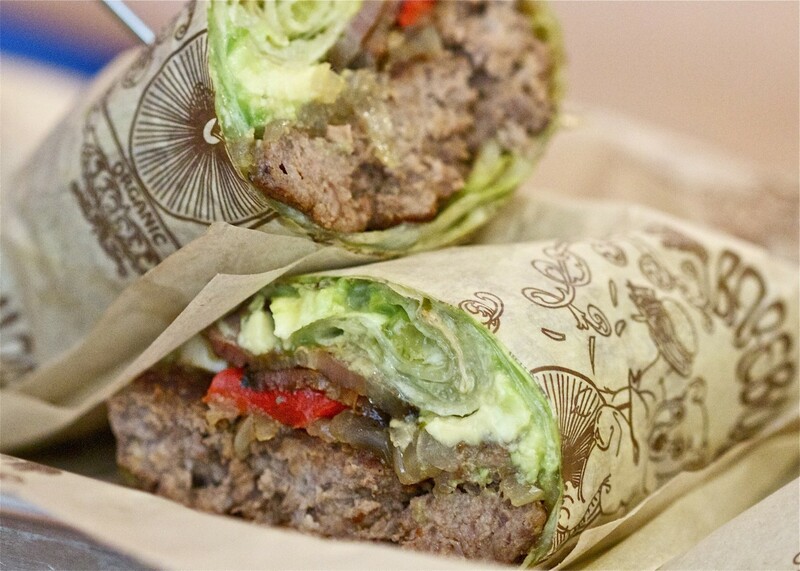 If you follow the Paleo Diet or simply want to go lower-carb you can order burgers in a gluten-free lettuce wrap. That’s what I had. The menu offers numerous combinations of meats and toppings. You select the type of bun (or lettuce wrap) you want, the meat and the variety of toppings. The combinations are virtually endless. Bareburger also offers several side dishes and even hard ciders for customers looking for a gluten-free adult beverage with their meal. 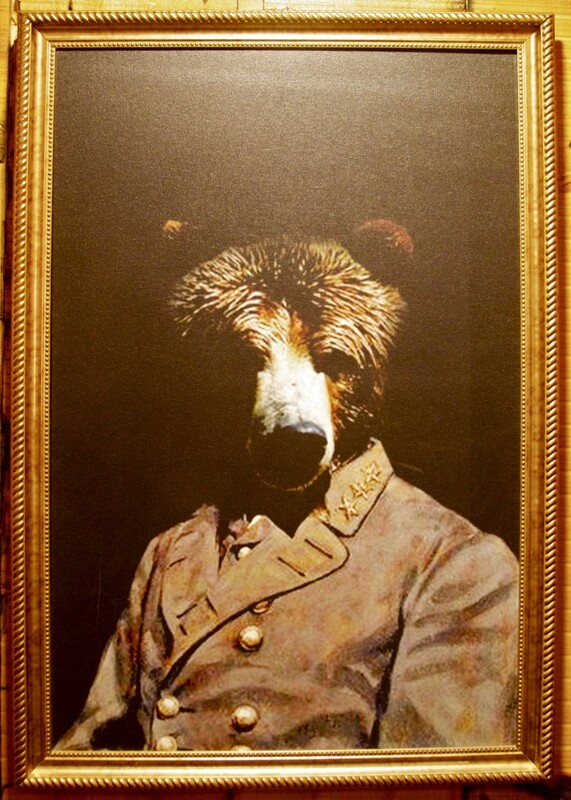 Even though they serve an impressive array of meats, there’s no BEAR at Bareburger. However, the sheer number of bear objects d’art made me wonder if this was an intentional play on words or a tragic error in grammar. 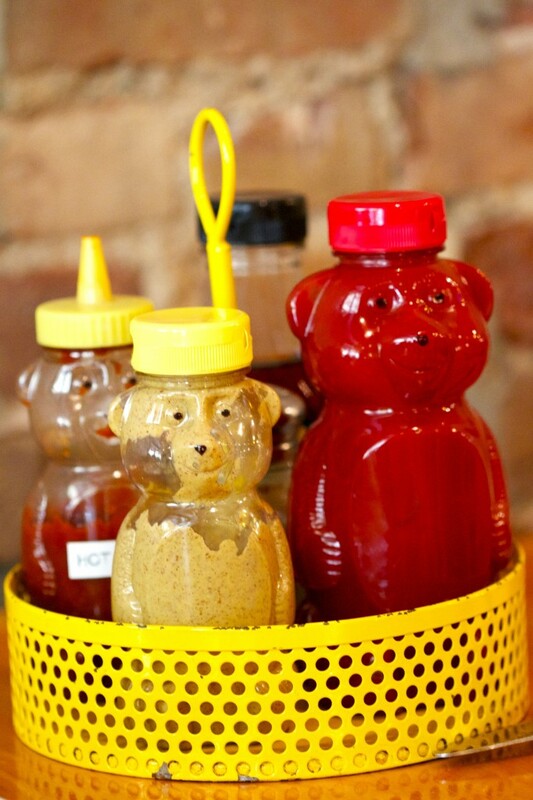 There were even bare bear condiment bottles! Bear? Bare? Whatever. They serve grass-fed, organic meat and pastured dairy products and that’s what I care about. 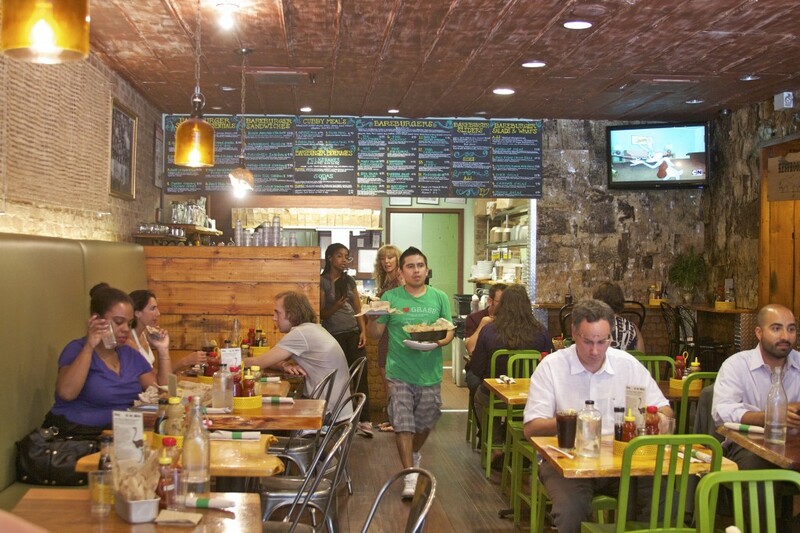 One of the other notable things about the interior of Bareburger is the use of recycled or reclaimed materials. Just about everything is from a sustainable source. This is true for ceiling tiles, utensils, to-go containers, tables and flooring, among other things. 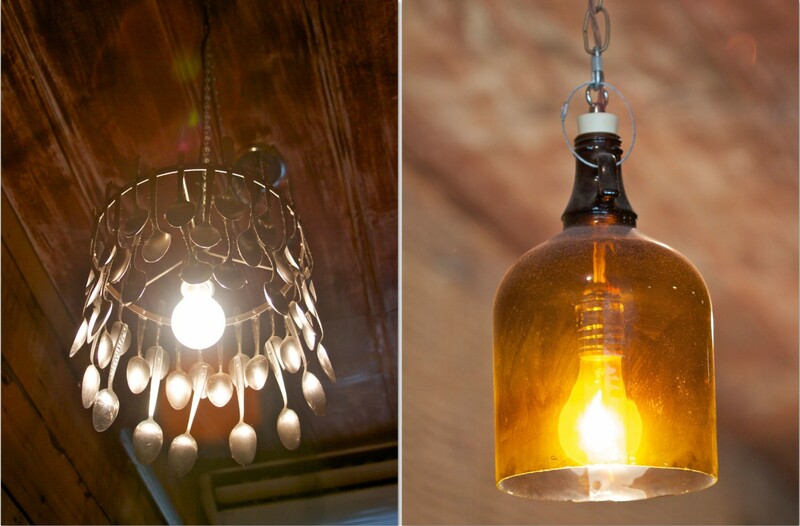 I love the glass jugs and old spoons turned into light fixtures. 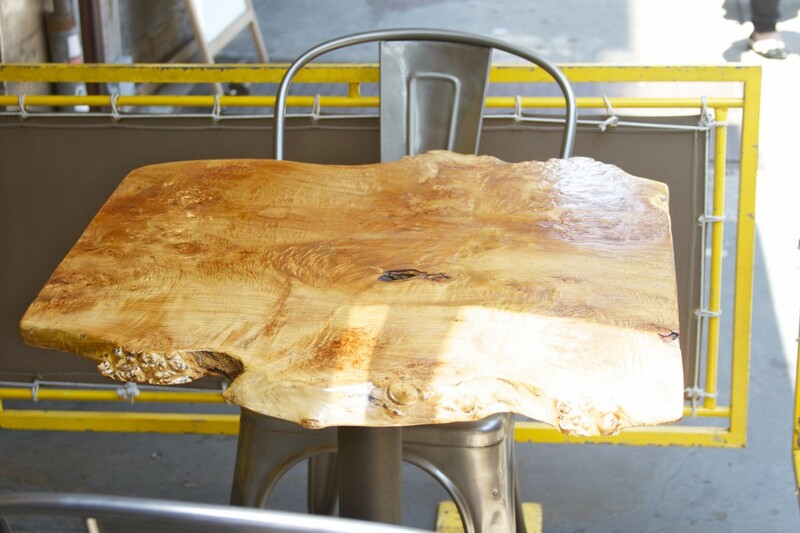 The tables lining the Manhattan sidewalk are topped with rustic wood pieces. 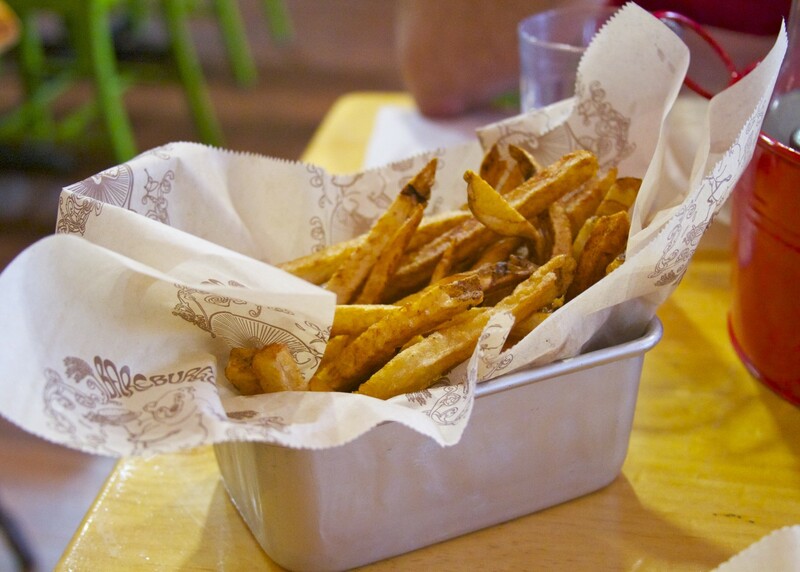 The fries come in recycled baking tins. They are gluten-free, cooked in oil that fries nothing else. I admit to “carbing out” a bit at Bareburger. But it’s not often I find gluten-free fries. The only other time was our trip to Elevation Burger in Montclair, NJ. So, I know you will cut me some slack. 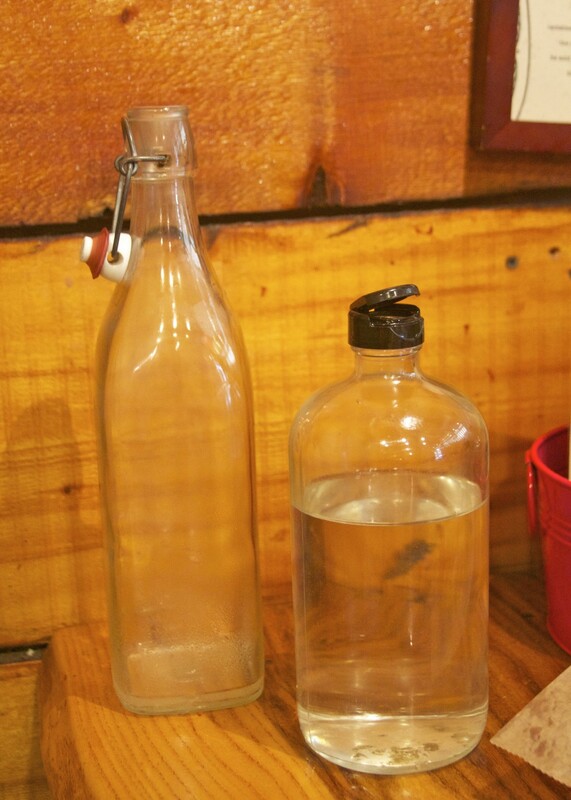 Water is served in random glass bottles. Quirky and cool. The decor materials were cozy and interesting. Overall the restaurant was casual and kid-friendly. The kids’ meals, priced at $5.95, are called “Cubby Meals”. (There’s that bear reference again. Argh!) The Cubby Meals come with a small salad and fries. The boys ordered their burgers with gluten-free buns. After trudging around New York City in the heat with two hungry boys I was in no mood to try arguing them into choosing a lettuce wrap. We do what we can, right? If you look closely at the photo of the interior (below) you will see the TV in the corner running classic cartoons. I’m not a huge fan of TVs in restaurants but it was a nice touch that sends a message of kid-friendly fun without being a “kiddie” restaurant. 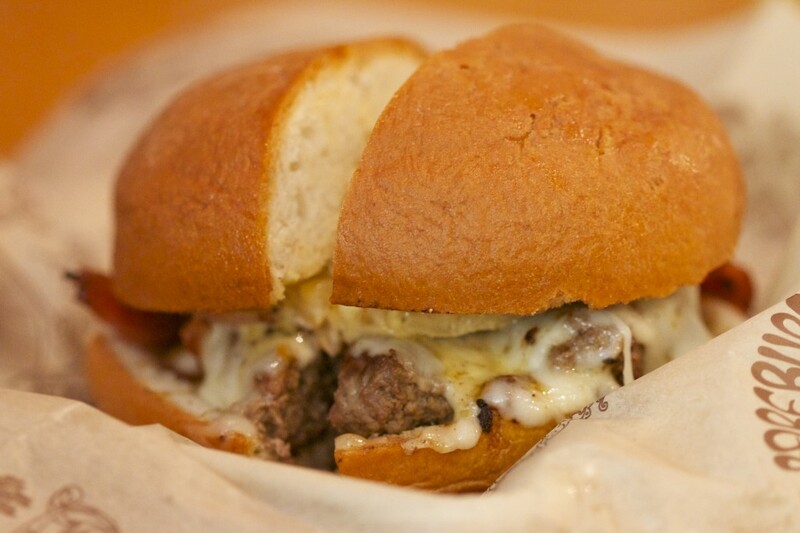 In addition to lunch and dinner, Bareburger also serves breakfast. If you happen to live or work in the vicinity you can have your Bareburger chow delivered with a minimum $15 order. They offer lots of other menu items besides burgers, fries and shakes. Here are the side salads my husband, G, and I ordered when I dragged him away from his office for lunch on a different day (sans kids). Spinach salad with blue cheese (pastured dairy), cranberries and almonds. For the trip with my boys I persuaded them to wear their “I Cannot Live Without Books” (Thomas Jefferson quote) shirts. There was angst involved. This may or may not have involved bribing them with the promise of chocolate shakes. 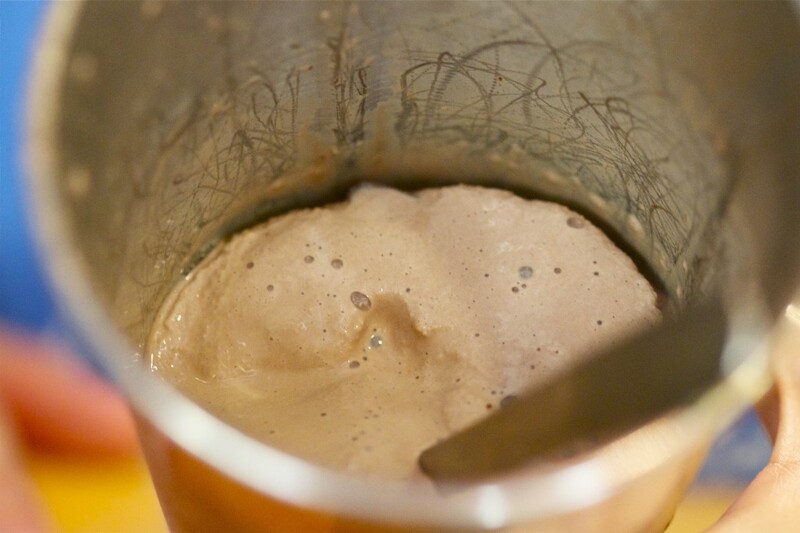 This is a chocolate shake that uses milk from grass-fed cows. I tried it and it was the best milkshake I have EVER tasted. EVER. Please forgive. 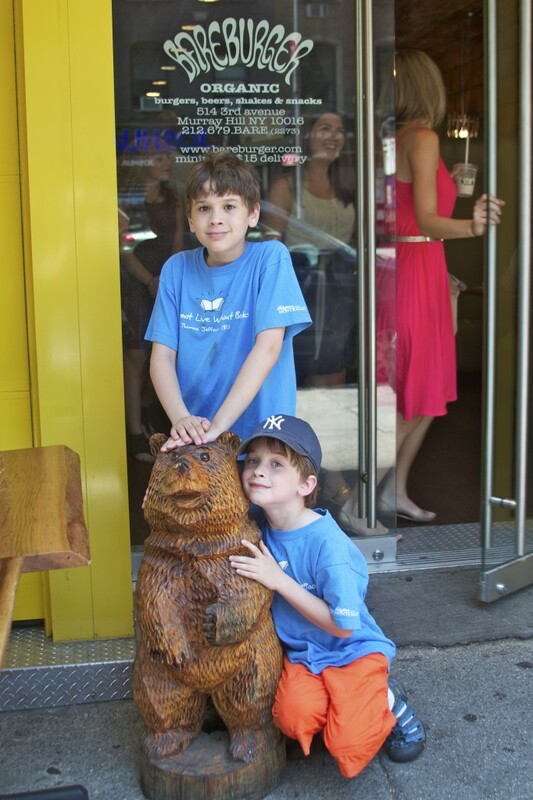 Ben and Nat posed for me outside Bareburger. Man, they are really good sports about posing. I’m so annoying. One word of warning: I had an extensive conversation with a server about my gluten intolerance/allergy and she claimed to understand it well. But even though their fries are gluten-free, their onion rings are NOT. Yet when we inquired about ordering onion rings the server suggested we order the combo onion rings and fries which come in one large container. Because I had already explained the gluten situation I ASSUMED she would not recommend something with gluten – much less put gluten-breaded onion rings WITH the gluten-free fries. I ended up getting “glutenized” as a result. Obviously I brought this on myself with even ordering fried stuff. You will be more careful, I’m sure. 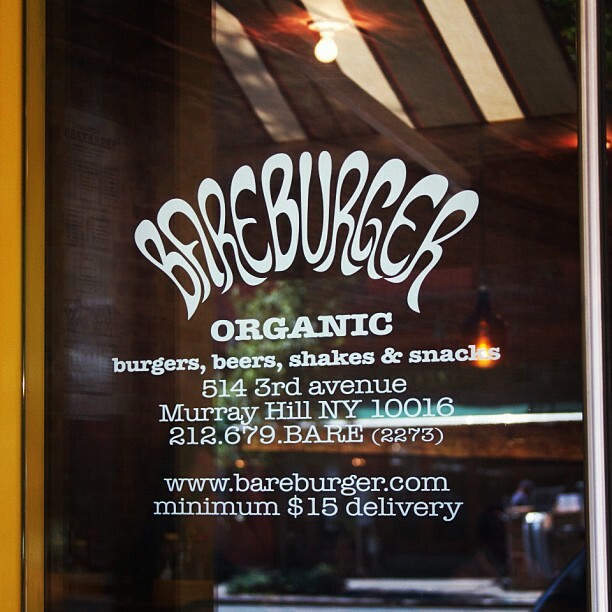 If you are in New York City and looking for a casual, paleo-friendly meal you should check out Bareburger. We ventured to the one in Midtown East (514 3rd Avenue between 34th and 35th Streets). 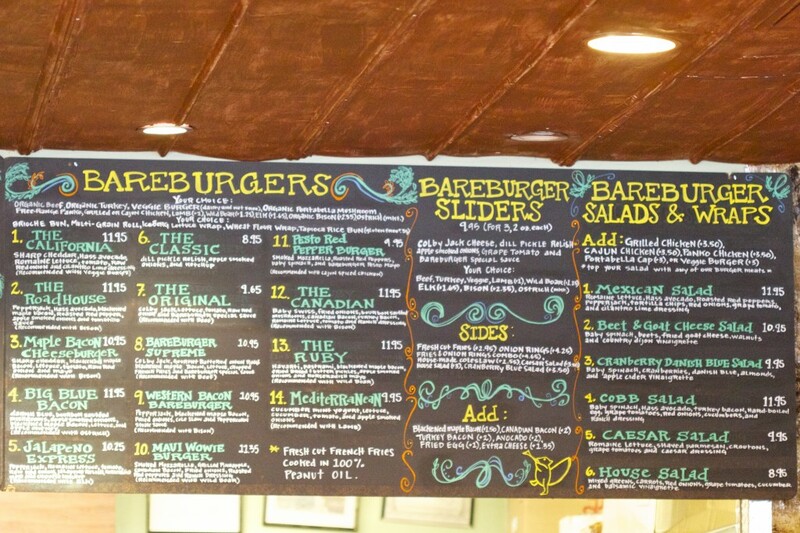 There are a few other Bareburger locations – one in Greenwich Village and one in Astoria, Queens. Check out their website for a complete listing. What do you think? Would you try the fries if you knew they were gluten-free or is that just asking for trouble (and unnecessary carbs?). How strict are you? 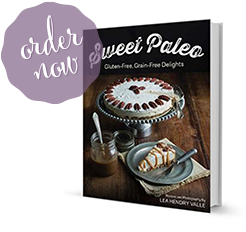 For more reviews and “experiences” with paleo-friendly restaurants in New York City and surrounding areas check here. 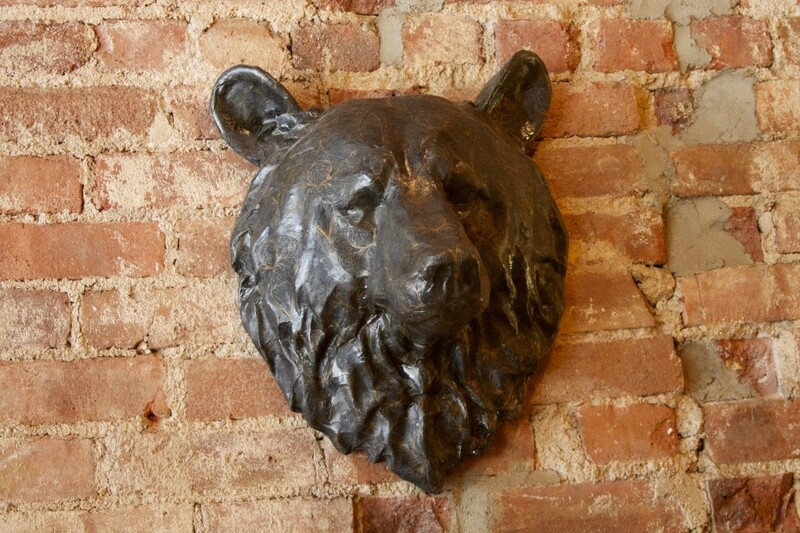 14 Responses to "Paleo and the City: Bareburger (New York City)"
It’s definitely worth a trip. The food isn’t exactly cheap, then again, nothing is cheap in Manhattan. But it’s worth it for the high-quality ingredients. I hope you get to check it out. Something to also keep in mind if you’re eating gluten free at Bareburger: I recently ordered a salad to go. The salad came with rolls that were wedged into the corners of the salad. That’s enough for cross contamination. Since I’ve never had a problem on multiple visits, I got too confident. Oh wow, that’s bad. It’s easy to get too confident when you think you’re at a restaurant that “gets it.” I’ve been to restaurants that just take the croutons off the salad after they’ve been on there a while and think that’s just fine. Very frustrating. I absolutely love this place! Although I’m never totally paleo when I go there, at least everything is of high quality. The fries and milkshakes are just too good to pass up! And the ostrich lettuce wrap was incredible. Not to mention the dipping sauces.. drool! I forgot to mention the dipping sauces. Those are great. And I have had an ostrich wrap there too. Very good. Grass-fed/finished burgers (cooked in a bit of coconut oil) at home tonight. No, I wouldn’t eat the fries, but I would sneak a small bite from someone else’s pile. You’re in NYC quite a lot! Sharon, your dinner sounds divine. You’re right, a few fries go a long way with someone who rarely eats them. My hubby works in NYC so we sometimes make the trip in the summer and meet him for dinner. Many times we end up in Chinatown at card stores looking for Yu-Gi-Oh cards. Such is life with two little boys. I will definitely remember Bareburger next time I am in NYC. Wish they had one in Philly (I live in-between ). I am lucky enough, however, to live within 20 minutes of the Elevation Burger in Moorestown, NJ and I will say while I always order my burger on a lettuce wrap, I do “splurge” and get their ….gasp….white potato French fries (fried in olive oil at least). 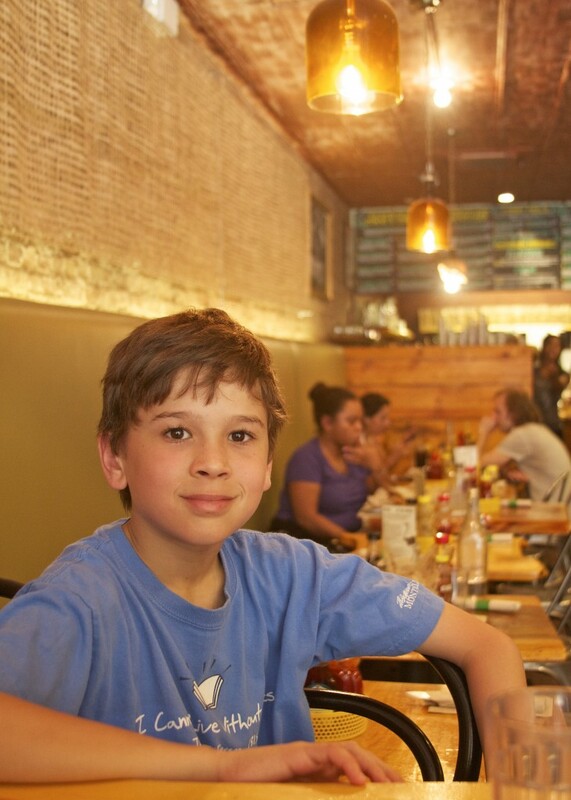 Thanks for the review of Bareburger and I love your blog:). Nice to see another Paleo follower who is also a Christian out there (loved this post http://paleospirit.com/tag/paleo-christian/). Thanks for the compliments. Glad you found us! Elevation Burger is great. I thought their lettuce wraps were super tasty and wish there was one closer to me. This place looks so good. We need one in London! Bareburger isn’t actually gluten free. They are very confused and give various messages, but the sum total is that their fries are not really gluten free, and neither is anything else. They aren’t certified by any GFREE groups for a reason–and they have way too much flour/breaded stuff to be considered safe unless they were. 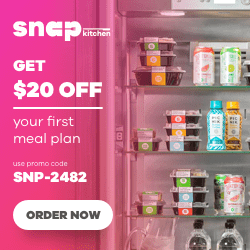 My boyfriend and I just started CaveKitchenNYC.com, a new Paleo supper club in NYC. 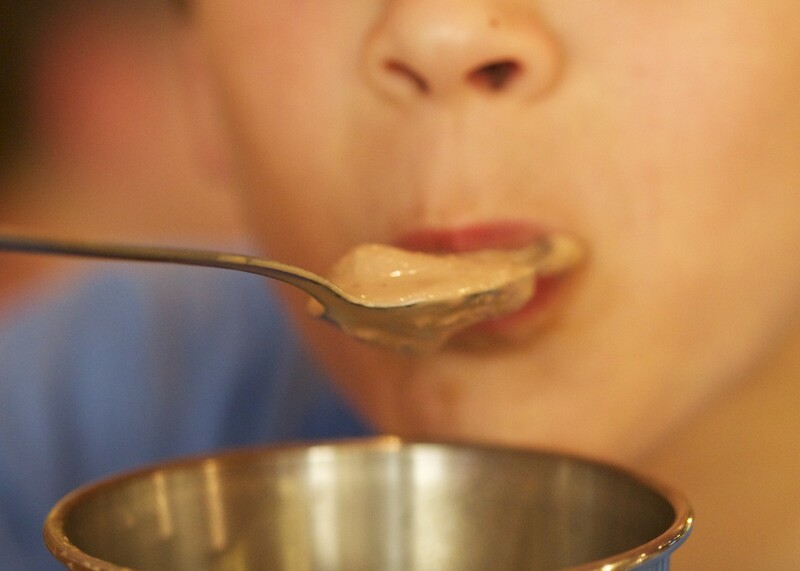 We started the supper club because we want to promote “clean eating” without sacrificing flavors. Please check us out and hope you will join us or help spread the words! That sounds like a great idea. I’ll have to check it out sometime. Thanks for letting us know.